Touch screens seem to be the must-have innovation of the decade as they’re seen in almost every new gadget and gizmo that comes out. But how exactly do they work and how can we use them? 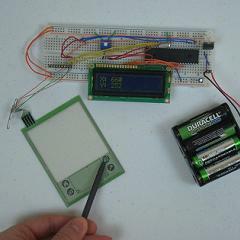 This PyroElectro article explains how a standard 4-wire resistive touch screen works and how to get the X/Y coordinates of a touched point using a PIC 18F452 microcontroller.